Notably absent from Wooley’s list ofpotential clients in his business plan was a “big fish” that was not already a client of the firm. The firm already represented State Farm, the largest homeowners’ insurer in the state. Then, think about the allegations that Wooley, shall we say, made life easier for Allstate while he was Commission and you’ll be ready to hit the road over to the Coast of Mississippi in September 2005 and the lawsuit Attorney General Jim Hood filed suit against five insurance companies. 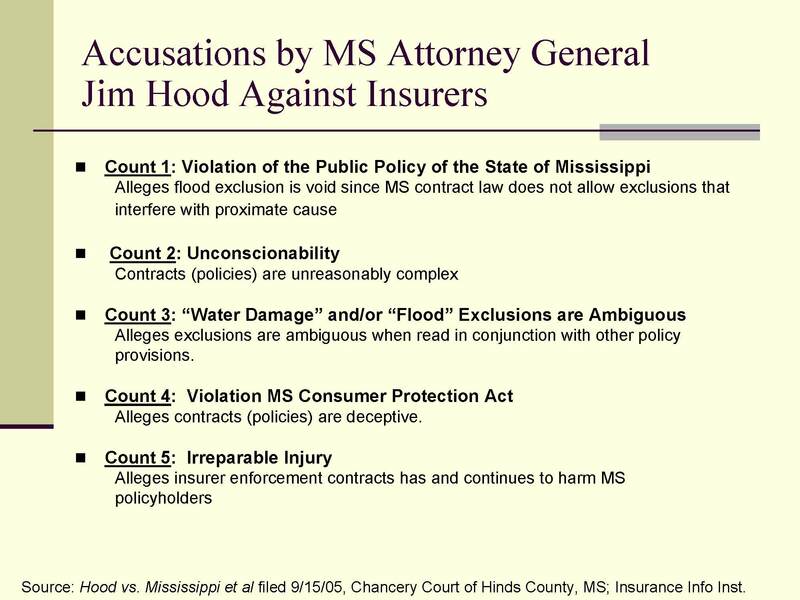 The suit highlights another chapter in the Katrina saga which, in this case, began in September 2005 when Hood filed suit against State Farm and other insurers, seeking to have their policies’ anti-concurrent causation clauses declared void and to enjoin enforcement of the policies’ exclusions. The anti-concurrent causation clauses provide that if a loss arises from a combination of covered and non-covered perils, the loss is not covered. A month after Hood filed the State’s lawsuit, a policy holder suit, Leonard v Nationwide, filed by attorney Dickie Scruggs. The different allegations in this case are illustrated, beginning with slide 134, in the full PowerPoint presentation produced by the Insurance Information Institute. Scruggs and four other law firms formed a joint venture group, SKG, and added other policy holder cases. By September of the next year (2006) SKG had over 600 State Farm policy holder cases and was engaged in settlement talks with the company. “According to Scruggs, settlement talks with State Farm had begun last September, but an agreement had been held up because of a criminal probe of the company by Mississippi Attorney General Jim Hood. A two-part class action settlement with State Farm was agreed to and presented to Southern District Judge L.T. Senter in January 2007. One part settled the claims of the policy holders represented by SKG and the other Hood’s suit on behalf of the State, expected to provide varying levels of relief for approximately 35,000 coastal homeowners. However, Judge Senter voiced several concerns about the terms of the settlement and did not certify the class but dismissed the suit without prejudice so the parties could resolve the issues and refile. Senter mentioned the outcome in an order he issued last week. When State Farm and the SKG declined my request for additional information concerning this proposed settlement I was unable to approve it, and it was ultimately withdrawn. Attorney General Hood’s comments at the time are equally telling. Had the additional information been provided as Senter requested, we would be in a very different place today as the third anniversary of Katrina approaches. So, why didn’t it happen? Ideally, this new agreement will speed the rebuilding process as homeowners begin to receive financial assistance to move forward with life. Not everyone was as optimistic. Attorney Zach Scruggs said later that most of the new deal between Dale and State Farm appears to be “an abbreviated, watered-down version” of the proposed settlement presented in federal court in January. “There is nothing preventing State Farm from low balling the people the second time around, and there is no recourse for the policyholder other than nonbinding mediation if State Farm does low ball them after a second review,” Scruggs said. A key element of the two-part class action was an agreement with Attorney General Hood that he drop the civil case he had filed shortly after Katrina. However, with the agreement with Dale in place and a settlement with SKG pending, State Farm demanded the Attorney General also drop his Grand Jury investigation, ending the criminal case. Hood reluctantly agreed in exchange for State Farm’s agreement to re-evaluate the claims of the 35,000 policy holders who had not filed suit; i.e., the class. The company separately settled with the policy holders represented by SKG and the venture group was awarded a $26,000,000 settlement fee. The settlement was finalized the end of January 2007. All that’s well ends well – and not only did the settlement didn’t end well, things actually got worse. By the first of March, one of the member firms of SKG would later claim it had made twenty-or-so requests for arbitration to split the settlement fees – and on the 15th of March, John Jones filed suit against Scruggs and others to force the issue in court. With his house on the Coast destroyed, Scruggs was living full-time in Oxford. Jones filed the suit there, represented by local attorney Grady Tollison – a seemingly unusual choice as bellesouth reported here – Tollison was representing a State Farm agent on the Coast in McIntosh. The case was was assigned to Circuit Judge Henry Lackey who not only agreed to let Tollison file the case under seal but sealed with the condition that only Tollison could remove it. Meanwhile, all was not well for George Dale either. Dale met the March 1 deadline to qualify for re-election as a Democrat. His application was rejected by the Party. Dale subsequently sued to be reinstated and briefs were recently submitted to be heard by a special chancery court judge. The judge, Henry Lackey, was appointed by the Chief Justice of the Mississippi Supreme Court specifically to hear the case. Counsel for Dale was Jackson attorney Greg Copeland. Copeland also is the attorney for the Mississippi Windstorm Underwriting Association, known as the wind pool. It is the insurer of last resort in areas at risk for hurricanes. Lackey’s appointment was made on or before the day Judge Lackey met with his long-time friend Tim Balducci at the end of March. Balducci would later testify under an agreement with the government that he was there to favorably influence Lackey’s thinking about SKG relative to the lawsuit filed by Jones. Lackey, in turn, would himself testify that after consulting with others, including the Chief Justice, he contacted the F.B.I. and reported their conversation as an overture to a bribe. During April Lackey had no contact with Balducci but met with the FBI at the end of the month and agreed to record future conversations with him. The Judge had plenty to do. In addition to his usual responsibilities, he heard arguments on Dale’s case during the month. His first recorded conversation with Balducci was May 3rd and on the 14th he ruled Dale could run for re-election as a Democrat. The commissioner said he doesn’t know whether either he or his campaign will pay for Copeland’s services. In August, Dale lost the Democratic primary, ending his 32 years of service as the State’s Insurance Commissioner. On the 21st of September, Lackey agreed to ask Balducci for money from Scruggs for a favorable ruling in the Jones case in order to determine if a bribe was taking place. Balducci delivered a payment on the amount Lackey requested on the 1st of November and was confronted by the FBI. After agreeing to cooperate with the government in exchange for a reduced sentence but there was no evidence tying Scruggs to the money, he agreed to engage in a consensual recorded conversation with Scruggs and others on the 9th of the month. Scruggs, his law partner Sid Backstrom, his son and law partner Zach, Balducci and Balducci’s business partner Steve Patterson were indicted on five counts of bribery of a judge on the 29th of November. In January, George Dale returned to private life and accepted a position with Adams and Reese. In March Scruggs and Backstrom made a negotiated guilty plea to one court of attempting to corruptly influence a judge and Zach entered a plea to the lessor count of misprision of a felony. Scruggs and Backstrom will be sentenced in late June and Zach the first week of July. No sentencing date has been set for Patterson and Balducci who are both cooperating with the government. Judge Lackey has not been charged with a crime. In November, Judge Coleman will decide the fee dispute. If policies did not have anti-concurrent cause language in them insurers would charge more to issue policies in Mississippi or not sell insurance there at all. Then everybody could buy insurance from some guy in an old truck named Bubba who keeps the cash reserves in the pocket of his shirt. Brian Martin, Legislative aid for congressman Gene Taylor points out. George Dale is the problem. He should not have approved ACC language in the first place, although I believe he has said he did not know it existed until after Katrina. State Farm agents have said the same thing. Why should states allow insurers to sell wind policies that will not cover all wind damage? Meanwhile, the slabbed are still slabbed. Wow, what a mouth full. Good work Nowdoucit. You can almost use Scruggs, Dale and Lackey in one sentence if you look close enough. By the way your “file under” family has hit an all time high. Thank you duesouth. I bet you’re right about that “file under” – it reached the point where it was hard to leave anyone out that’s for sure. Did you look at that PowerPoint? Duesouth, about that “one sentence”…if you were writing it, what would it say? Just curious. Thanks. Great post Nowdy! Dinner is on me tonight. Just can’t come up with a good sentence, without ranting, but I bet there is one. What would judge Lackeys motivation be to set Scruggs up. He doesn’t act like the money kind, maybe advancement in the system. From what I read, it doesn’t seem like Balducci just came out and offered the judge a bribe. though some of those wire tap transcripts were hard to read. Add a favorable ruling by Lackey for Dale, who really loathed Scruggs, and you get one big ol fat conspiracy theory. Wow came up with that sentence after all. Nice hike nowdoucit..
Glad you came along for the hike, duesouth and “wow” back to you for that sentence. At this point, the outcome seems to be that Scuggs will go to jail and a lot of other folks will do their time in hell. duesouth, I just re-read your comment and wanted to make certain you knew that Lackey has testified under oath in the Jones case that there was no quid pro quo in what Balducci offered him – meaning no bribe until he asked for money – he wanted Tim to tell him no when he asked. How naive of him to think that particularly when he asked for it because he was in a personal bind. What’s weird is that Balducci did tell him that he was asking the Judge to do anything that was he was uncomfortable with. didn’t he? I believe it went something like ” I need fourty to get me over a hump “. Whats up with that. If someone is getting brided by Scruggs it’s going to be more than ” fourty “. duesouth, IMO the entire Balducci episode has been misread from the get-go. I’m guessing that what they thought was Balducci had talked his way into their business and Lackey had asked him for money in the process – not that the money was even related to the Jones case but that Lackey was trying to show Balducci how much he appreciated his help dealing with the “bind” he’d gotten himself in by offering to help Balducci look good to Scruggs. I read the transcripts as them trying to stay as far away from Balducci as they could without making him mad and having him really screw up their business. Next Next post: Misprision – What is a “reasonable” time?